The Centre County Planning Commission, through the comprehensive planning process, makes recommendations and decisions to maintain and enhance the high quality of life for all residents, in accordance with the Pennsylvania Municipalities Planning Code, and other laws and regulations of the Commonwealth of Pennsylvania and the County of Centre. The Planning Commission is comprised of elected officials to represent the regions of the County. Planning commission meetings are held the third Tuesday of each month at 6:00 pm in Room 146 of the Willowbank Office Building. 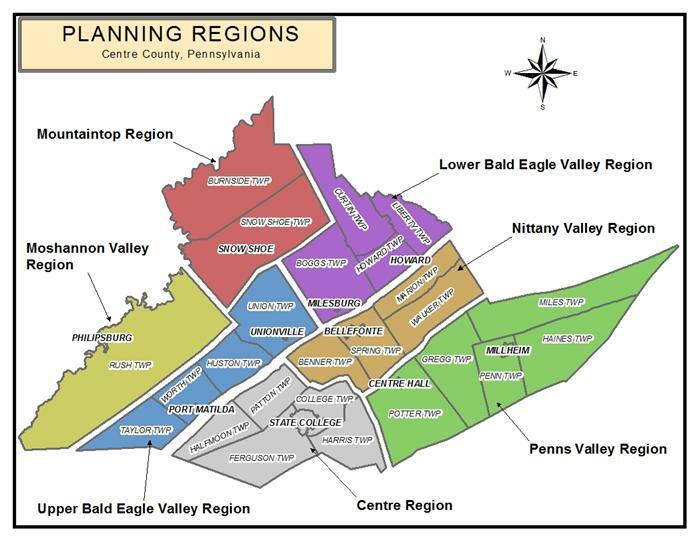 The Planning Commission is comprised of elected officials from the seven planning regions: Centre Region, Lower Bald Eagle Valley, Moshannon Valley, Mountaintop, Nittany Valley, Penns Valley, and Upper Bald Eagle Valley. The members are appointed by the Board of Commissioners.